I'm going to use my blog to keep you updated about Melissa. It's so nice to hear from everyone who is calling to find out what's going on, so check here and I'll keep all the information about her condition posted. I should say our days have been kind of blending together so I might be slightly off on a few things and also my medical lingo can be somewhat sophomoric. Last Sunday (one week ago today) Melissa was having an asthma attack and could barely breathe. She went to the emergency room and was put on oxygen and inhaled steroids, sat for about 4 or 5 hours and was discharged. 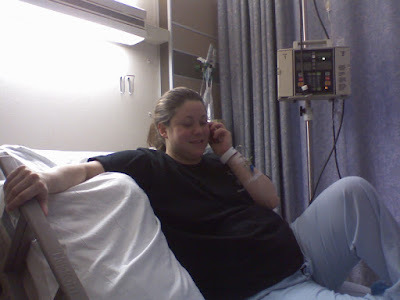 Wednesday about 10:00 pm I got a call from Mommy that Melissa was going back to the ER, again she couldn't breathe. I met them there and was surprised to see Melissa was having even more trouble breathing than Sunday, who would've thought that was possible. The doctor took one look at her and said she was being admitted. We spent many hours over night in ER until a bed opened up. 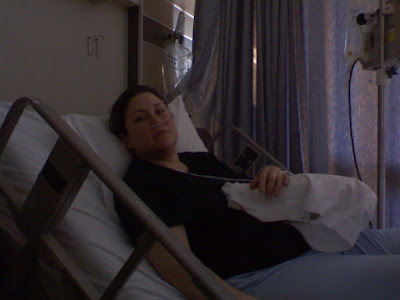 Melissa was again put on breathing treatments and an IV was started. She was at times near panic from the in ability to breathe and from the pain she was feeling in her chest. We got a text from Jordyn that Maya, sick with fever at home, was awake and that we should come home, so we left Melissa and we all got about 2 hours of sleep. So Melissa's been on some massive doses of prednisone and is checked frequently for how she's moving air. Her potassium level was low so she was put on a potassium drip which burned her terribly and made her very sad. We thought she would be released the next day but the doctor said she wasn't showing improvement- the air sacks in her lungs were still spasming. Friday we spoke the the nurse practitioner and expected Melissa to be released on Saturday- when Melissa asked about if she was going home, the lady's eyes practically jumped out of her head and she said, "Uh, NO!" as if she were spouting blood from an artery or something. Whoa. So we've pretty much been taking turns staying with her and taking turns staying with Maya in addition to getting stuff from her apartment, grabbing food, movies, that kind of stuff. She's even been doing her school work and managing to meditate too. We learned on Saturday that these massive doses of prednison have to be gradually lowered and that it would be several more days in the hospital once Melissa started showing improvement, which really is happening at a snail's pace. The lung specialist said to just be patient with this process. Thursday we even managed to put on our happy faces and attempt to celebrate Gray's 5th birthday. 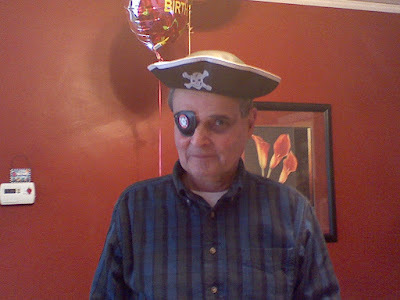 We were all so overtired that everything became funny, like Paul wearing Gray's new pirate's costume. Arrrrr. So here we are, it's Sunday night and I just got a call that Melissa's blood pressure is 160/110 and of course this is not good. I believe too she was running a slight fever yesterday. She also walked for about 20 feet today and immediately needed another breathing treatment. She is tired. She is bruised from all the needles. She got a cat scan today I think to check for nasal polyps, I don't know if she knows those results yet she was just told she has a lot of fluid. Wednesday night she also had a chest xray to make sure she didn't have pneumonia- it was clear. The medicines they are giving her can cause a lot of things so the trick here is to determine what is a legitimate concern and what is merely an affect of the medicine. Her white blood count has been going up- that could either be from an infection or from the prednisone which lowers your immune system. It also messes with her sugar level and she becomes diabetic only when on this medicine- they attempted to give her a massive dose of insulin, which she refused, and I'm not sure if she's had to take any further. She certainly hasn't been fasting- her appetite is robust to say the least. So that's where we are now. I am able to update this blog from my phone so as I know something, I'll post it here. I'll also be able to immediately see your comments if you'd like to leave anything or if you have questions I'll try my best to answer them. If you want to send Melissa healing messages, or well, any messages, you can leave them here too, I'll make sure she gets them. Yay! Aunt Cathy's the first poster!! Hey, good luck and I hope all turns out well for you. My asthma is very minor and only when I exercise wrong. Too much, too soon, and I get into trouble.